Nicola Sturgeon is on a collision course with the Westminster Parliament that could result in the biggest Constitutional Crisis the UK has seen since the Irish question of the early 1900's. Currently Westminster is the main UK Parliament and is supreme over all the devolved assemblies in Scotland, Wales and Northern Ireland. In a disgraceful move Sturgeon will attempt to introduce her own EU Withdrawl Bill through the Scottish Parliament in order to derail the Brexit process and introduce EU law into Scotland which would cause massive problems for the future of the UK. The Speaker of the Scottish Parliament is set to rule that this bill is not legal for the parliament but Sturgeon will still press on. Sturgeon and the SNP are now deeply unpopular in Scotland with many of their ridiculous Liberal and Globalist policies especially in relation to Immigration and the EU where surveys have consistently shown that people in Scotland share the same views as the rest of the UK. It has also been suggested that Sturgeon will use Brexit to try and break the UK apart with a second Independence Referendum. 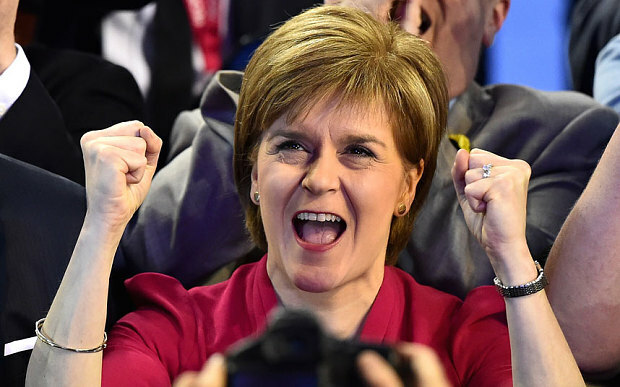 Do you agree that the UK is stronger United and are against the poisonous Sturgeon?